Since the Grand SFU Sushi Crawl was totally not a traumatizing experience, I thought it would be a great idea to do a Grand UBC Sushi Crawl as well. With seven places to visit instead of five, I knew this crawl would require that much more endurance and careful planning. Using my good judgment, I got Vancity Noms, who managed to finish exactly zero pieces of sushi last time, to help me on this adventure. This post will cover the first four. 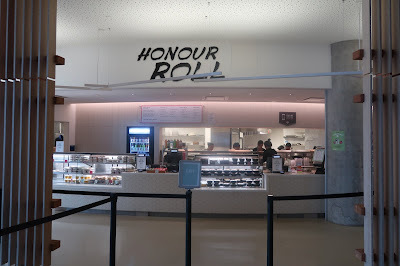 Back in the days of the old Student Union Building (SUB), the sushi stall was originally named Honour Roll. The name changed to Peko Peko when the new SUB opened, but has now reverted back to Honour Roll. Featuring a good range of slightly pricey pre-made rolls, we hoped that the sushi was honour roll–worthy. 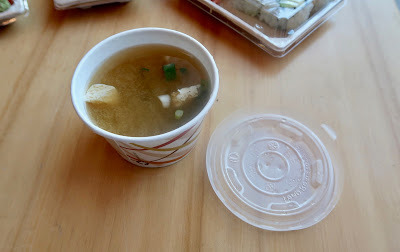 Since I badly needed something to drink after all the energy expended on finding the Nest, I went for the Miso Soup. It came with green onion and tofu and had a well-balanced flavour. However, the pieces of tofu were awkwardly coarse, as if they had been accidentally left to dry for a few minutes. Coming in six generous pieces was the Real Crab California Roll. We found it slightly dry, and it could've done better with a little more mayonnaise. 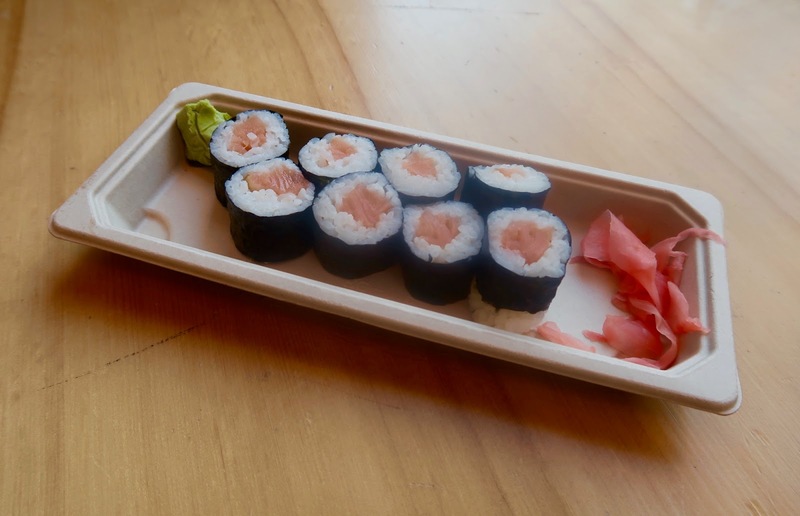 One of the more decent rolls that we had was the Smoked Salmon Roll. The smoked salmon was strong and rich in flavour and went well with the avocado. However, there was a small bit of saltiness intrinsic to the roll, which meant that the roll did not pair well with soy sauce. 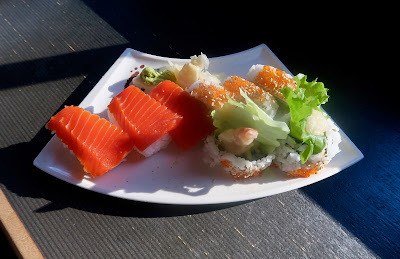 Next, we had the Salmon Roll, which was a bit too tightly packed. The salmon also had little flavour. One thing I thought I'd never eat in my life was the Avocado Roll. I used to hate avocado as a kid. 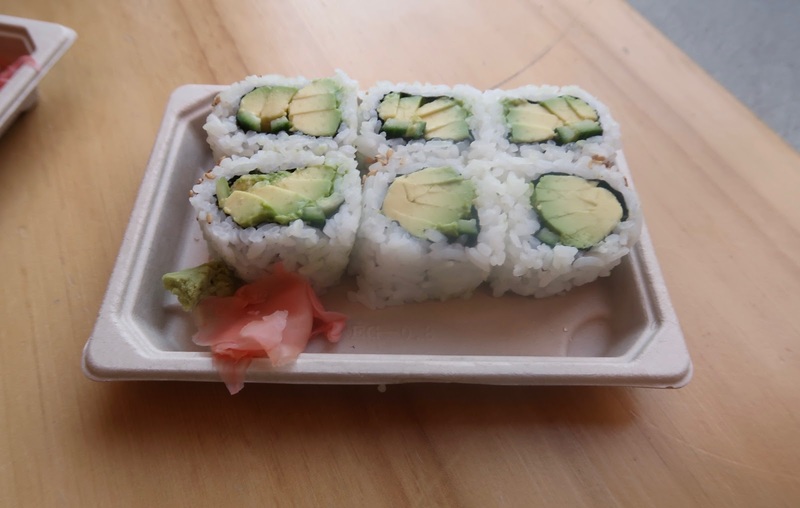 I would pluck every piece of avocado out of my sushi and then stare evilly at the avocado mound I had just created, thinking of ways to destroy the mound. 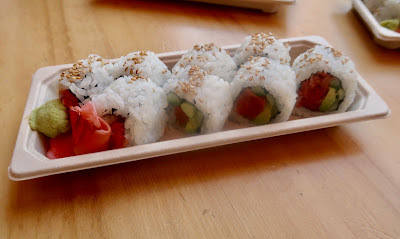 However, since Vancity Noms ordered this roll, I took the plunge and had one piece. It tasted surprisingly decent, and the level of creaminess was just right. 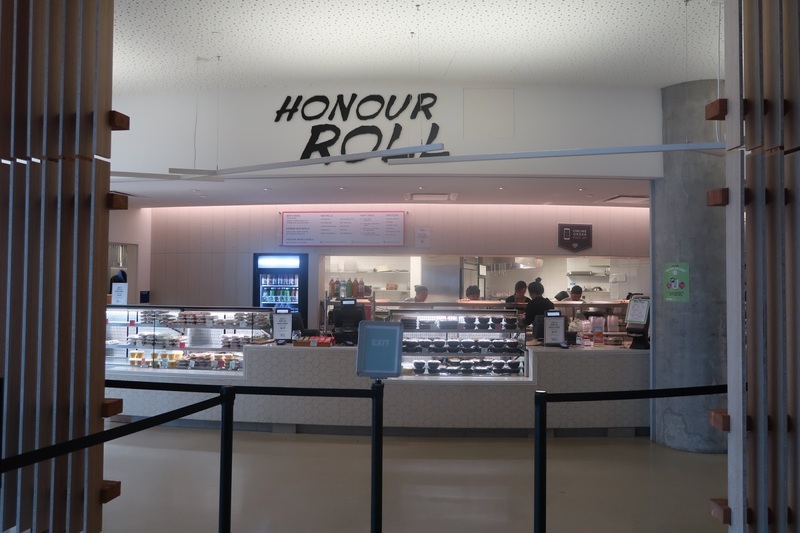 Our overall impressions of Honour Roll were quite positive. Although the sushi was pre-made, it was superior to pretty much everything available at SFU. 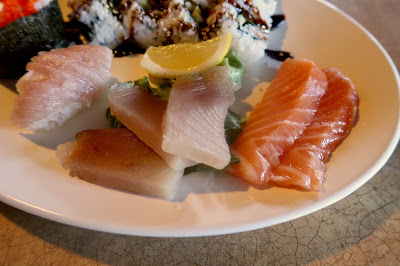 I was unable to stop Vancity Noms from eating loads of the sushi at Honour Roll. After she had consumed about 20 pieces of sushi, I had legitimate reasons to be concerned about how we were going to get through the rest of our crawl. Meanwhile, since I had to eat at four different places for lunch, I tried to keep the food quantity reasonable by ordering only one plate of food. We were off to a great start with the highly questionable Tuna Sashimi. It was not too fishy, but it was also not soft at all and tasted slightly cooked. The Salmon Sashimi fared much better. It had a smooth texture and was creamy and reasonably fresh. 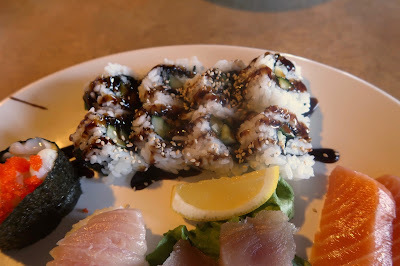 The Una Q was a roll with a eel and cucumber. There was so little unagi that Sauce Q would've been a much more appropriate name for the roll. The cucumber inside was fresh and crunchy though, so I'll give them credit for that. 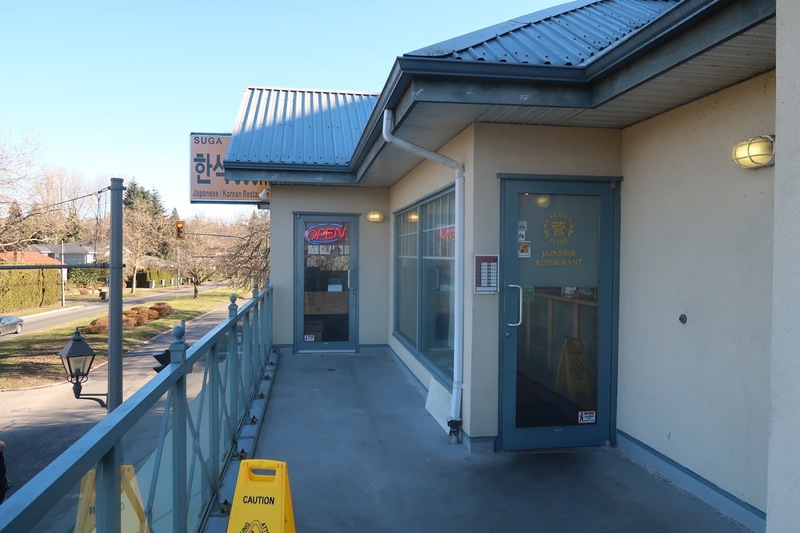 Suga Japanese & Korean Restaurant seems to be a particularly bad case of being stingy on the pricier ingredients and then trying to make up for it by giving you more of the cheaper ingredients. I'm not big on portion sizes at all, but for me, this was unacceptable. It didn't help that our server was clearly unenthusiastic throughout our visit. Located just steps away from Suga Japanese & Korean Restaurant is Mio Japan, a popular teriyaki place that also serves nigiri, sushi rolls, and sashimi. Vancity Noms was done at this point, but she remained a good sport and watched me as I devoured unreasonable amounts of sushi while taking forever to write down my notes. 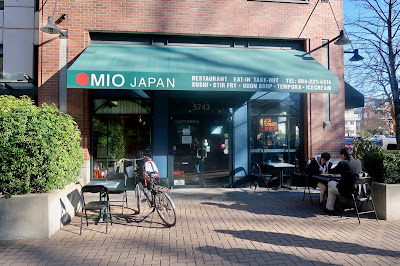 Knowing that Mio Japan's specialty was teriyaki, I wanted to go for both the teriyaki and the sushi, but without help, I could only choose one or the other. Since I had to stay true to the name of my blog, I went for the Dynamite Combo. Moving on, the Dynamite Roll, although it came with only one prawn, was savoury with a nice creaminess coming from the avocado. The sushi rice was just a touch dry. 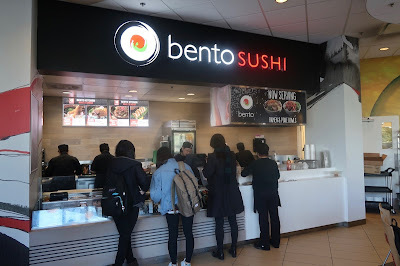 Since Vancity Noms had class later in the day, we ventured back towards the middle of the campus and found ourselves at Bento Sushi, a part of the mini food court at the David Lam Management Research Centre (beside the Sauder School of Business). As we were still in prime lunch hours, the entire food court was very busy. In the display refrigerator was an assortment of pre-made sushi combos, each costing about $10. Feeling like a samurai after having wolfed down two meals' worth of sushi, I went for the Cali-Samurai Combo. 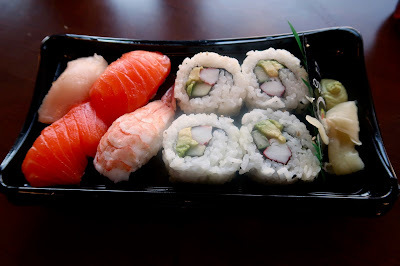 Unfortunately, the sushi ended up being very expensive for the quality. The sushi rice in the nigiri was so tightly packed that it was actually somewhat hard to chew through. The tuna in the Tuna Nigiri was rather mushy and tasted like mashed wet paper. 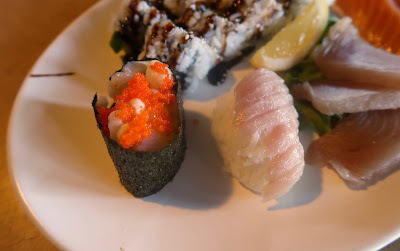 The Salmon Nigiri was not flavourful, though the Ebi Nigiri was at least noticeably sweet. 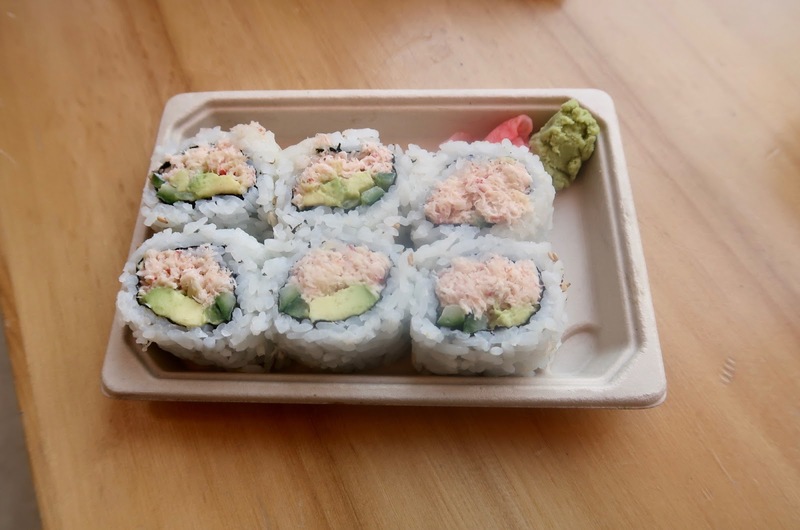 The California Roll came with creamy avocado but was very rice heavy, and the imitation crab stick was either weak in flavour or simply got lost in the sea of rice (or both). After finishing the Cali-Samurai Combo, Vancity Noms had class to go to, and I needed a break from all the soy sauce I was consuming. With nothing good to do in the meantime, I crashed one of Vancity Noms' classes and wished upon my lucky sushi stars that I wouldn't be called to participate. It worked. Perhaps the fact that I fell asleep in the middle of the class helped. 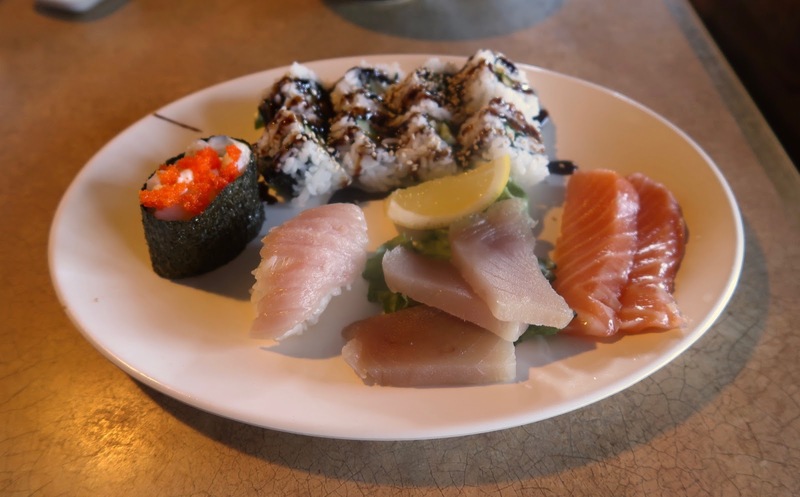 Click here for Part Two of the Grand UBC Sushi Crawl!